Minus 3 overnight with light snow falling as I go to bed. Forecast 40C, high 50MPH winds here today. Don't light a smoke. Here in NE england we have had about an inch of snow overnight but with the high winds this is causing problems with drifting snow on my drive the snow is none existent on one side of the car but is about 6 inches deep on the other but will still be going out for our Sunday lunch. ...6 inches deep on the other but will still be going out for our Sunday lunch. Snow is long gone and grass is green here in cold Canada( Vancouver) Sunshine and 60 f yesterday. 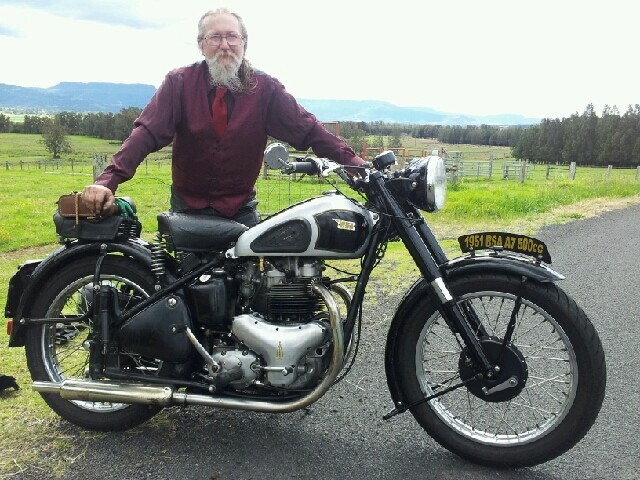 Went riding but not on the BSA. Out on the John Deere 350b building pasture fence. Well, a good sign is that our tortoise has decided to make an appearance after surviving the recent bitterly cold weather in his little hut. He survived the bad winter of 1963 in my parent's garden (I was in the Far East, so missed it ). He's at least 68 years old, has always lived outdoors and has the free run of the garden and makes his way back to his hut at the end of each day. Photo is of my wife feeding him after his hibernation as he hasn't the strength to do it himself for a day or so. Hi Tortoise I bet he's got a cute name. Don't tell us; let's have a guessing game. My guess is Alfred. I have a tortoise but he is a comparative young-un at just 8 yrs. His name is Earl. We had a blizzard Saturday teatime ,really wild high winds and absolutely freezing ,cleared by Sunday afternoon but still bloody cold here in Liverpool. I'm picking up a Plunger petrol tank from Leicestershire tomorrow. I'm trying to persuade myself that it would be enjoyable to go on the Beeza. Ideally heavy rain today to wash salt & grit off the road, and warmer temps tomorrow would good. Yeah - it's the salt I can't stand. And they've dumped piles more round our way this year compared with before. And for no good reason on the whole, I'd have to say. Seems a bit odd given everything else that's being cut back on. It might be this stupid thing where if council and government departments do not use their full allocation of something, (or budget) it automatically gets reduced the following year. I believe the highway authorities were storing them in a huge warehouse somewhere but they've realised that the potholes were getting close to their Use By date so they have been loading trucks up with holes and have been installing them on the roads. I heard that one truck was carrying a massive pothole when it fell off the back. It hadn't been properly strapped down you see. The driver reversed to pick up the hole, the truck fell into the hole; the vehicle and the driver were never seen again. Tragic! Page created in 0.285 seconds with 21 queries.